The wet summer is having a "dramatic effect" on ground nesting bumblebees, according to a conservation trust. Species at risk include the great yellow, which is the rarest in the UK and clings to survival in areas of the Highlands and Islands. The Bumblebee Conservation Trust launched a national garden watch and a drive to boost the insect's numbers earlier this year. It said rain-sodden ground and moss was a threat to certain species. Ben Darvill, of the University of Stirling-based trust, said data collected so far from the public on bumblebee sightings was still being collated. However he explained: "The bad weather is having a pretty dramatic effect especially for ground nesting bees. The ground in which they nest is being saturated." Mr Darvill said he did not believe species will be wiped out, but populations may suffer. Declining numbers could have a knock-on effect on the pollination of crops and flowers, he added. Species at risk include the great yellow and moss carder, which nests in mossy tussocks. 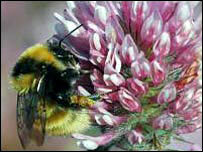 He also said it had been a poor season for the more common red-tailed bumblebee. Mr Darvill added: "We'd encourage people to keep sending in their observations. Bumblebees will be seen in abundance until autumn, but because of global warming we are also looking for sightings over winter too. "We would also encourage people to carry on planting wild flowers in their gardens."